December 1997. After a walk of two days with only a few hours of sleep I arrive at the market of Tabanya, completely exhausted. The Nuba people stare at me and when Commander Eskiel comes to greet me, I collapse and cry that I can't go on. He takes me to his headquarters and calls for a doctor. I stay with Eskiel for a week, celebrating Christmas with the people of Tabanya, before he escorts me across the dangerous plain to Fama. Now we meet again. My name is Eskiel Kuku Talodi. I was born on October 21, 1963, in the area of Toroji. I grew up there. I went to school, but I didn’t finish it. I quit in the fourth year when my father died. It was on February 15… I can’t remember the year, somewhere in the early seventies. Life became very difficult. We had a big family; I had six brothers. I was the first born, so I wanted to help my mother, because she was alone. I worked in the fields to grow sorghum and our wellbeing depended on the seasons: if the rains were good, we had a good harvest, but if the rains were bad, we wouldn’t have much. When I grew up I started to notice the problems in the Nuba Mountains: the marginalization of the area. The system was treating the Nuba inhumanely; the people were suffering. Then the [Sudan People’s Liberation] Movement came up in the South, in 1983. They addressed us over the radio; talking about the rights of the people, about freedom. Some of the Nuba joined the SPLA, like late Commander Yousif Kuwa. 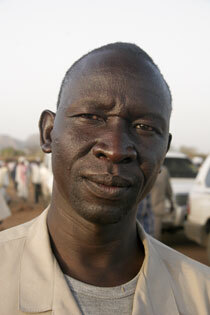 He also spoke on the radio, telling the people to come and join the SPLA to take their freedom. At that time I didn’t really consider joining, but things happened that made me want to go and join them. I was part of a group of youth who was accused of having contacts with the SPLA. We were all civilians and we hadn’t even thought of joining, but we were arrested all the same by the local military. They threw us in jail and they tortured us. I have a friend who cannot feed himself because the soldiers cut of both his hands. They killed a lot of innocent people. There’s another thing that made us very angry with the system: some people were doing just fine, while others were living a very poor life – the animals were treated better than them. This type of life forced us – the people of the area, the youth – to go [to join the SPLA]. We sat together and we discussed the situation, we discussed our lives. We were about three hundred and in the end we decided to join the SPLA together. It was really a difficult decision, because the family was alone. But we were fighting for the country and in the end the family is less important than the Sudan as a whole. I just prayed for God to help them when I went to achieve my goals. We went to Fariang, because they are our neighbours. From there we went to Upper Nile and then to Ethiopia. Yousif Kuwa met us in the middle, and he took us from the refugee area of Bilfam to the training centre in Bonga. He came there and told us about the Movement; he explained the vision. Of course it was all familiar to us because we had heard it before on the radio, but he made it clearer. After I had been trained, we returned to the Nuba Mountains in 1989, under command of Abdelaziz. We arrived in Fariang and stayed there for a while to rest. We entered the Mountains by night, passing Lake al Abiad [where the Arab nomads had their camps]. We had very clear orders not to engage with the civilians [so we went around them] to hafir Nigeria [a hafir is a place of water, NotE]. But the Arabs had picked up our trail; they had followed us to Nigeria and engaged us there. We fought all the day. In the end they ran away and then we continued to Fama, arriving there at seven o’clock. It was March, the rainy season, and we stopped at a hafir that was full of water. We thought we might take a rest and drink some water, but then we were ambushed. The government army came with a lot of soldiers, heavy artillery and a tank. They fought with us, the first battalion, and with the second battalion commanded by Telephone Kuku. The battle was very heavy; it lasted for three hours, but although we only had our handguns, we managed to repulse them. So that was the second battle, after the first at Nigeria. During the fight the civilians had been watching. After the battle we met with them there, and we stayed in Fama for two days. Then the Government army regrouped and attacked us again. That was the third battle. We came under heavy fire: they had heavy artillery and tanks; we had our cause to fight for. We had come and we didn’t want to go back. The good thing was that we were two battalions, ours and the one under Telephone. In the end they ran. We destroyed the tank and we confiscated a lot of their heavy artillery; we even took some prisoners of war. We settled in Fama, but at that time there was no chance to go and see my family in Toroji [which is not very far from Fama, NotE]. I knew they were still there, and I sent them a message to stay where they were, because most of the Mountains had become a combat zone. Soon after the battle at Fama we moved towards Kurungu, and as soon as the Government had information that we were there, they attacked us. We fought with them in Kurungu for two whole weeks and then we got orders to retreat. It was a very difficult time, and it was not even our goal to stay there, so we moved to the West, to Moro. Again we had orders not to touch the civilians on the way: we were just supposed to go to Moro. But the Government made an ambush in Al Hamra: they had armed the people there to attack us. So we met them in the road with their guns, but we were not supposed to engage them. Then the Government forces attacked us and we were caught in the middle. We fought with them for two days. The fighting was very heavy and we suffered many casualties. We were devided into two by the enemy. I was heading a coy at the time – that is three platoons or about 150 soldiers – and I made it to Moro, but Ismael Khamis Jelab was driven to Kurungu and all the way to Daloka. We went back to assist him: we reunited at Daloka and then brought the forces to Moro. The battalions were redeployed: Ismael went to the Western Mountains, to Julud in Koalib, and two battalions remained in Moro. My battalion remained in Moro, in Shambe, and six months after we entered the Mountains I could take leave to look for my relatives. I found them outside Toroji, because the Government had attacked the town; they had burned the houses and the people had run away. My family was in good condition though. Now Comrade Yousif came to the Nuba Mountains with the Volcano battalion. He had been waiting for our forces to be in place before coming from Fariang. He established his headquarters in Toroji. The enemy was in the centre of the town and we were in the surroundings. I was transferred to his battalion and I stayed in Toroji for a while; I received my first star. The headquarters was moved to Brham and then to Tabanya in 1990 and later to Changaru. I remained with Volcano until the headquarters in Changaru were built and Yousif moved there. Then I was sent to the operational areas in the South. I was leading the force that captured Kululu and I brought Fama under our control. By 1993 I was transferred to Moro, as a commander of a battalion, but when the Government took Brham, on January fifth of 1994, I was sent back to this area. The Government also chased us out of Toroji. Telephone Kuku was commanding the Brham area at the time of the Government attack; he wanted to join the Government, didn’t he? I can’t comment on that, but after the Government took all these places, the leadership came and called Telephone back to [the headquarters in] Changaru. They put me in command to replace him. The situation was so difficult. We were one SPLA battalion against three Government battalions, and we didn’t have enough ammunition. If we hadn’t had our objective [of a New Sudan], we would have surrendered. It was only from 1997 onwards that Yousif was able to send us more ammunition. 1994, 1995, 1996: those years were really bad. When I met you in 1997 I thought you were just a very tough fighter. But listening to you now, I get the feeling that you had to talk a lot to convince the people. That is true. The situation of the army was weak and we needed to make the civilians understand the objectives of the Movement, we had to convince the people, make them understand their cause, so they wouldn’t turn to the Government. The enemy had a big force, but we asked them to resist and to be strong. We were able to manage the situation military. The challenge was to make the people feel happy; make them forget their troubles for a while. At that time this gawadja appeared among us in the Nuba Mountains. Commander Yousif told me that there was this guy, a journalist, who wanted to see the people. You stayed with us in Tabanya and I had the feeling that you were someone with an objective. You wanted to know a lot about the Nuba. I was very happy with you because you stayed with us in tough places. We even took you to Fama. There were ambushes in the road and it was dangerous, but we managed to get you there. You were really tired and your feet were sore and the grass cut you but you continued. I remember you wanted to smoke, but you had ran out of cigarettes. We were walking through the tall grass and you were sniffing the smoke of the local tombak [tobacco] the soldiers were smoking. I felt this gawadja wanted something, so I gave orders to collect the tombak from the soldiers to give it to you. I considered you to be part of the struggle. After we arrived to Fama, you worked hard, you used many rolls of film and we were very happy with you and you talked to everyone. In 1998 I saw you again, at the battle of Koia. Yes, I had came from Kurchi, and I was commanding the first battalion. There were three battalions participating in the battle, I was in the middle of the fight, leading the soldiers. The brigade was commanded by Yousif Karra; he was giving us orders over the short range radio. The battle of Koia was won, but the next year was disastrous: Tabanya was taken, along with Fama, Shatt, Kululu, Kurungu… You were not there? No, in 1999 I was commanding the 25th Brigade – that’s five or six battalions - in Kurchi. Brigadier General Aized Kuku was commanding the 28th brigade; he had his headquarters in Kululu, and Yasir Kafi was commanding Tabanya when the Government took it. It was not a very difficult time, but the Government army took the people completely by surprise. I came to see the people who had fled from Tabanya to Kadoro; that was in June 2000. We met again… why were you there? I had been transferred from 25th Brigade, to take over the area in the South. The Government was burning the farms and houses and the situation of the people was very bad. I wanted to be here with them, to help them if I could. The last big battle was at Ardan in 2001; did you participate too? I wasn’t there during most of the fighting, but I came to assist them on the last day, and with our reinforcements we were able to end the battle. It was on January 2nd. The people had suffered a lot during the war: they didn’t have food or clothes, there were many diseases. Some of that improved. The killing stopped. The life of the civilians became better when the JMC came to the Nuba Mountains and worked here. Now there is some more medical assistance and food aid here. Did you participate in the peace talks? No, I didn’t. But Abdelaziz was there and he contacted me from time to time. The Comprehensive Peace Agreement was signed on January 9 of 2005. Surely there’s a difference between the time of war and the time of peace. We are now realizing the program of the Movement for the Sudanese people. The Government has recognized that the SPLM was fighting against injustices. The two parties sat together and signed. From the SPLM, we feel that the people in the marginalized areas have been given their rights. So the peace was signed, and I’m seeing some development for the Sudanese people; some improvement. We from our side are implementing it though, because we feel there is no reason to go back to war. The Sudanese people have had enough. But at the moment the Government is not serious to implement the agreement they signed in Nirvasha. Up to this moment the Government did nothing. They don’t want to release the finance to the SPLM. They’re still keeping the money so the SPLM can’t use it for development. Right now we feel that at least we have our freedom – but the rest is still not there. But by more international pressure and pressure from the SPLM we want the Agreement to be implemented. We are in Sudan, we can marry without limit. I could marry twenty if I like, but now I have six wives and fifty eight children. Not all of them are here. My eldest son is in Kakuma, some are away on visits. Maybe, when you return to Holland, you can send me some child support! Hahahaha. Do you have anything to add to the interview? Not really; I just want you to know that the Government is not serious about the agreement. The things that we agreed: if they don’t give it to us, we don’t know what will happen. But when they are serious, there will be no problem. You know the 1972 agreement [the Addis Abeba Agreement between Nimeiri and the Anya Nya I, NotE] gave us a lesson. [Nimeiri returned on his promises to the South and the civil war was resumed.] We fear they want to repeat it. At that time they were just playing around. But they can’t do it a second time. There’s a saying: you won’t let someone poke your eye twice. You’ll be very cautious because you don’t want to lose another eye. That’s all really. I want to thank you. We were friends before, and now you’ve come to visit me in my house. I hope one day I will visit you in Holland. Oh! There is a nice story from that time in 1997 that I almost forgot…. One time the women brought us some food. They brought us some mullah [stew] from the region, called burnuq. It’s made of sorghum and it’s completely black. They cooked it with meat, but I thought the gawadja would never eat it, so we brought him milk. But then he ate the burnuq and he said he wanted to put it on his body so he would become black like us. In Tabanya they are still repeating this story. Interviewed in Frandalla on April 10 , 2006.